Those magnificent men in their flying machines are sending the first manned rocket to the moon. It's all Phineas T. Barnum's idea. The extraordinary showman has discovered a German inventor experimenting on explosives with enough power to propela projectile through the galaxy. And the hilarious Victorian space race begins. But who will be the first to land on the moon - the British or the Russians? Reach for the stars with an all star cast in a crazy comedy caper fuelled by laughter and madcap misadventure. 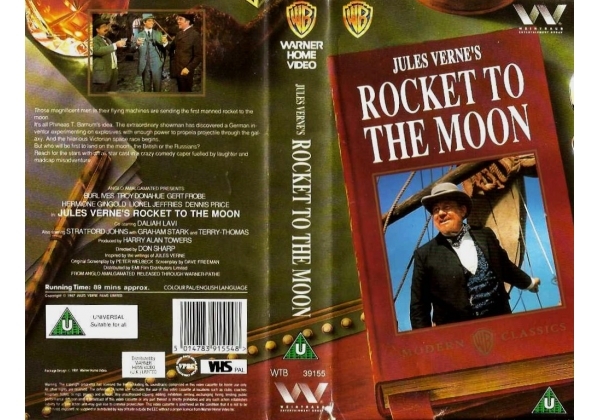 © Jules Verne Films and Anglo Amalgamated. Or find "Rocket to the Moon" on VHS and DVD / BluRay at Amazon.